The Identify-Zit™ multifunction wire identifier is a simple to use troubleshooting tool designed for the high density installer or systems contractor who does not always have an assistant or helper on site. This tool can identify up to 32 different wire runs at the same time, without the need for a two man crew. Simply attach the appropriate Identify-Zit™ Cap (BNC, F, RJ-11, RJ-45, etc.) to one end of each wire run (up to 32 runs) and attach the “decoder” to the opposite end and the number on the cap will appear on the decoder display screen. The Identify-Zit also checks for continuity and will display “CC” (for closed circuit) if there is a “shorted” connection, “OC” for a failed connection/open circuit, or “OO” if there is too much resistance on the line. The Identify-Zit™ Identifier saves enormous time, particularly when testing multi-line high density panel or rack installations. 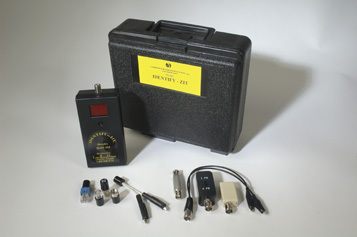 /n The Identify-Zit™ Identifier comes pre-packaged in a protective hard case in one of five different base applications: (1) Wire; (2) Coax; (3) BNC; (4) Telephone; or (5) CAT-5. In each base application, the kit can be ordered with either 8, 16, 24 or 32 caps for that specific application. For maximum versatility, order your base kit in the application you install most. Order additional caps for other applications so that you can use your Identify-Zit™ Identifier in all your installation jobs. All kits come with IDZ Decoder. Tests all your lines in one operation!